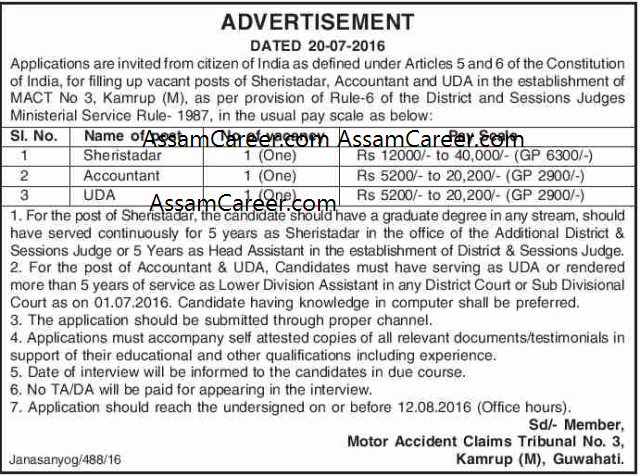 Motor Accident Claims Tribunal No 3, Kamrup. 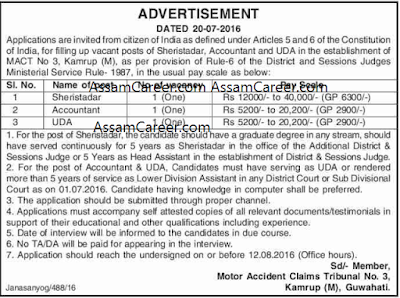 Applications are invited from citizens of India for filling up of the post of Sheristadar, Accountant, and UDA in the establishment of Motor Accident Claims Tribunal No 3, Kamrup. Educational Qualification: Candidates should have a Graduate degree in any stream, should have served continuously for 5 years as Sheristadar in the office of the Additional District & Session Judge or 5 years as Head Assistant in the office of District & Session Judge. Educational Qualification: Candidates must have serving as UDA or rendered more than 5 years of service as Lower Division Assistant in any District Court or Sub Divisional Court as on 01­07­2016. Candidate having knowledge in computer shall be preferred. How to apply: Applications must accompany self attested copies of all relevant documents/testimonials in support of their educational and other qualifications including experience.